HEAD: Long and broad, light in proportion to body, big clear eyes, long broad snout deep jaw clean jowl. Big ears, set wide apart and broken over. BACK: Long and arched, wide and even from neck to rump. SIDES: Long even and well let down to flank. SKIN, COLOUR and COAT: Medium red to chocolate, skin soft and pliable, free from wrinkles, hair fine straight and plentiful. 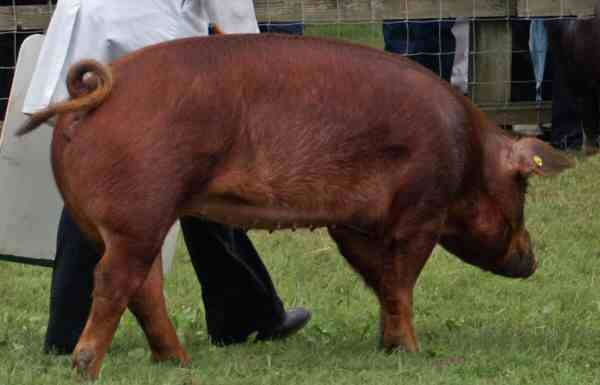 Return to Duroc Pigs page.